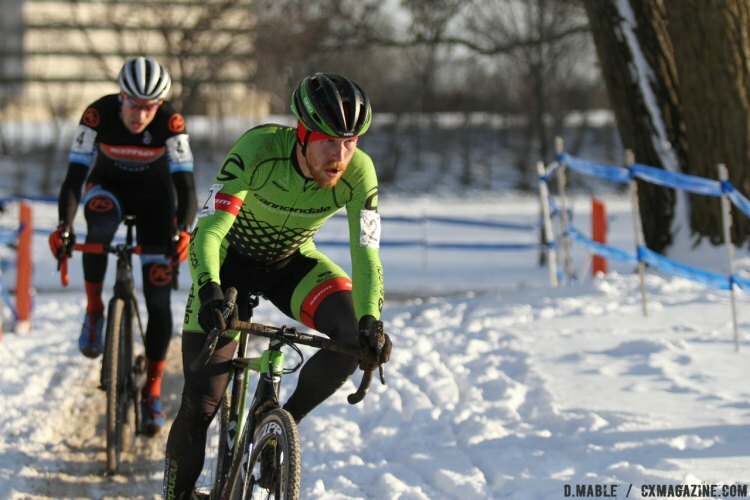 Running across the finish line on foot ahead of a sprinting Jamey Driscoll (Clement) is probably not how Stephen Hyde (Cannondale Cyclocrossworld) envisioned winning his first U.S. Cyclocross National Championship, but it will suffice for the red-haired rider. 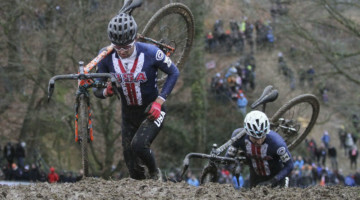 After taking the lead midway through the race, Hyde dominated the latter portion of the race until a mechanical-plagued last half lap almost dashed his National Championship dream. Hyde hit the back half of the course with a 15-second gap back to Driscoll when he suffered a flat front tire. Already past the pits, Hyde was forced to continue riding on the damaged front tire as Driscoll made one final late-race surge to get back to him. 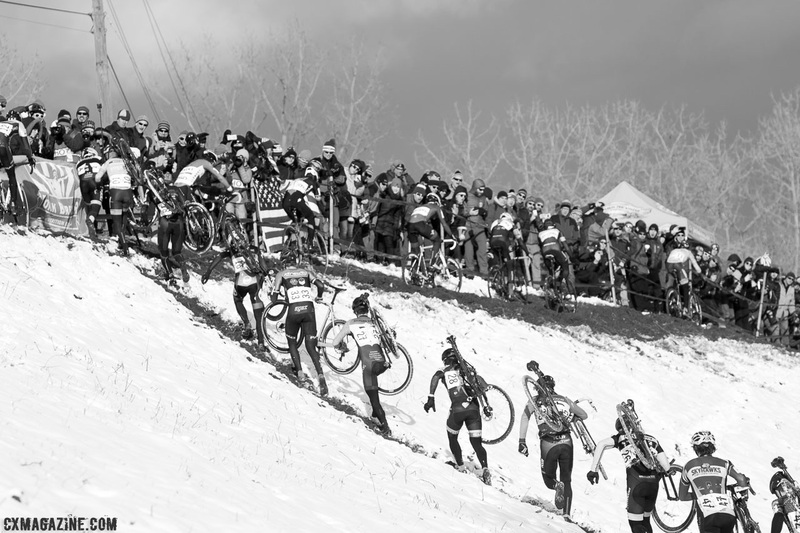 With the finish line in sight, Hyde suffered a second, more catastrophic mechanical on the last off-camber before the steep elite-only section. His flat front tire slipped out on the icy, rutted off-camber and when he crashed to the ground, he broke his derailleur hanger, leaving the component dangling lifelessly off his bike. After summiting the run-up, Hyde coasted down the descent onto the start/finish straight. He gave a few skateboard pushes on the pavement, looked back, and when he saw Driscoll’s new red Clement kit rounding the corner, he hopped off his bike and sprinted the last few meters with his bike raised above his head. Hyde took the holeshot and led the racers into the first trip up the embankment, but once on the top, he crashed while trying to ride the narrow high line at the top of the unique feature. A traffic jam formed behind Hyde, and the lower line emerged as the better choice for the first lap. One of the beneficiaries of Hyde’s mishap was Yannick Eckmann (Boulder Cycle-Sport/YogaGlo). Eckmann rode half of the embankment section along the bottom before running up the hill. He was able to open up a sizeable gap heading off the levee as the other riders dealt with the melee behind Eckmann. One of the riders caught in traffic was three-time defending National Champion Jeremy Powers. 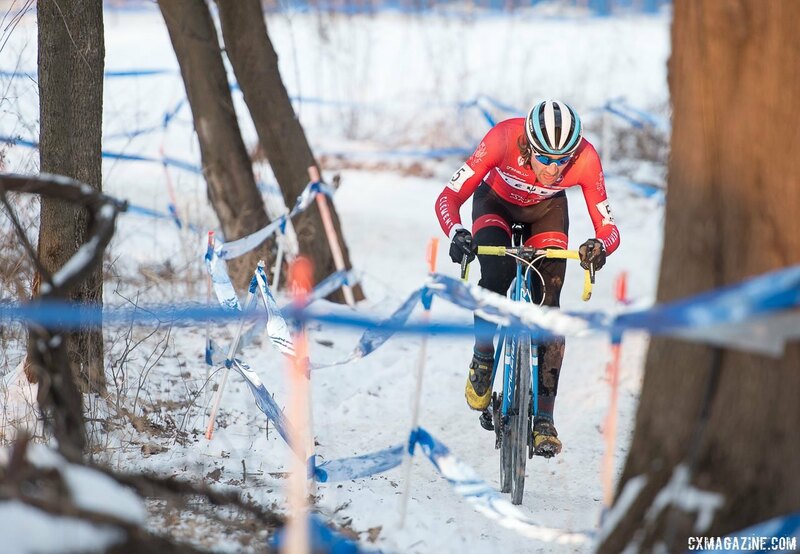 Powers fell behind Hyde and then suffered a major crash in the woods that injured his knee and essentially ended his chance at contending for the podium in Hartford. With two laps in the books, a large group of seven riders sat at the front of the race. Hyde had worked his way up to the front and took the lead of the group heading out onto the course for lap three. 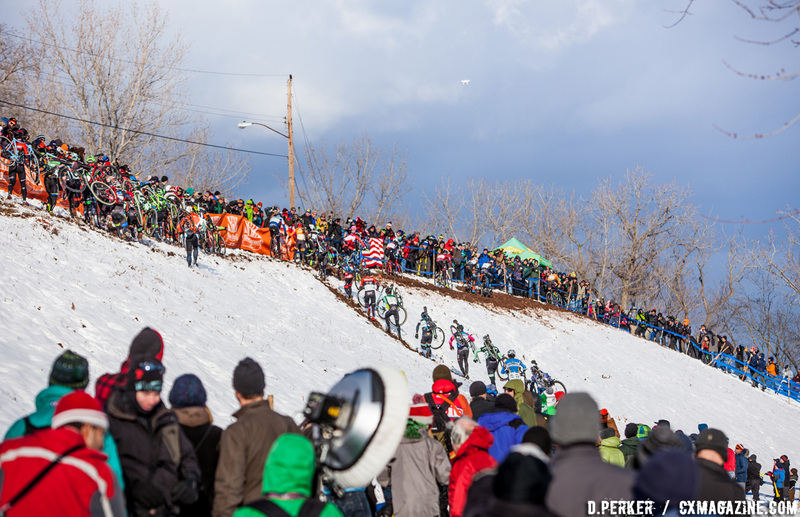 Hyde crashed on the slick levee off-camber, but was able to retain his lead because other riders could not maneuver around him. Hyde eventually got off the front solo while the chase behind him sorted itself out. Kerry Werner (Kona Endurance Team) was with Hyde for a while, and then Jack Kisseberth (JAM Fund/NCC) took up the chase in second. As the afternoon progressed, Kisseberth would emerge as one of the stories of the afternoon. The JAM Fund rider has experienced success in the Northeastern U.S., but on Sunday the entire nation would begin to learn his name. 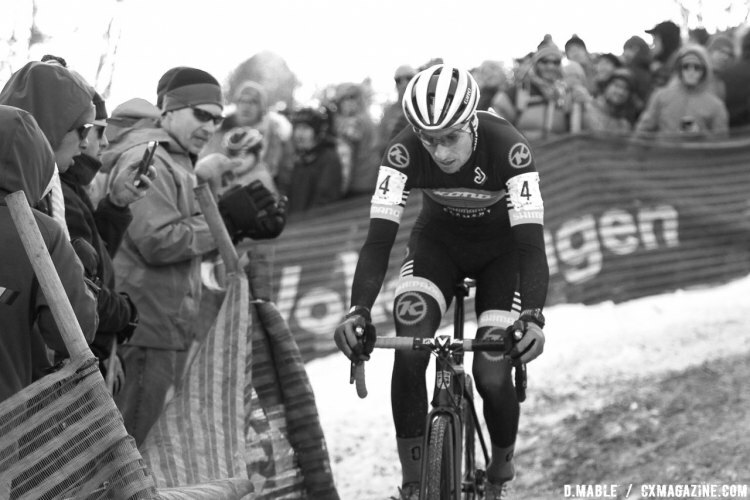 He would ultimately finish the race in fourth, drawing huge cheers from the New England crowd each time he rode up the steep elite-only section and navigated the icy descent. 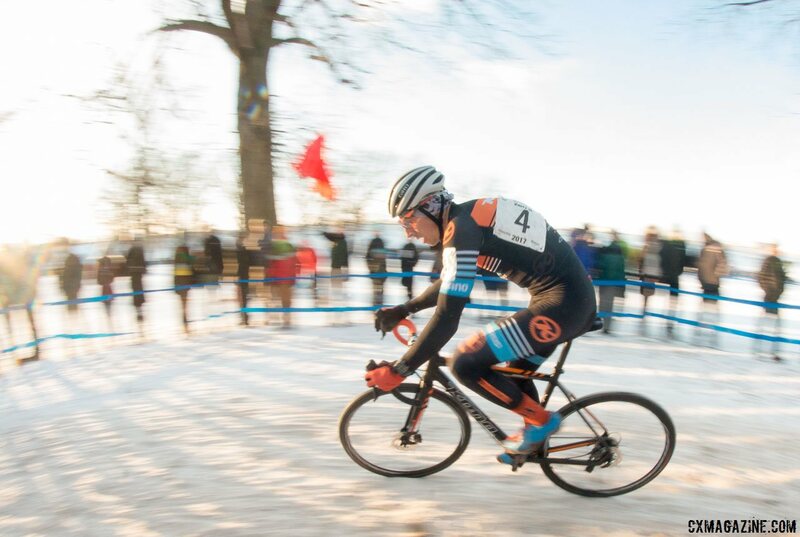 As he crossed the finish line he pumped his right arm to celebrate the ride of his young cyclocross career. Jamey Driscoll came into Sunday’s race as a bit of an X-factor. Driscoll recently became a father; his child was born two months ago. 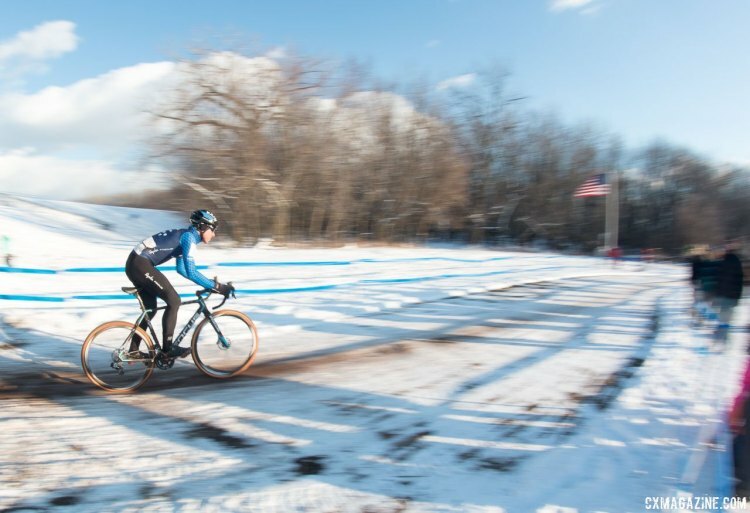 He took a month off of racing between October and November before returning to the cyclocross circuit two months before Nationals. Driscoll got off to a slow start on Sunday, but could be seen slowly working his way through the field while getting stronger and stronger as the race progressed. He eventually worked his way to the second position midway through the race and took over the duty of chasing down Hyde. 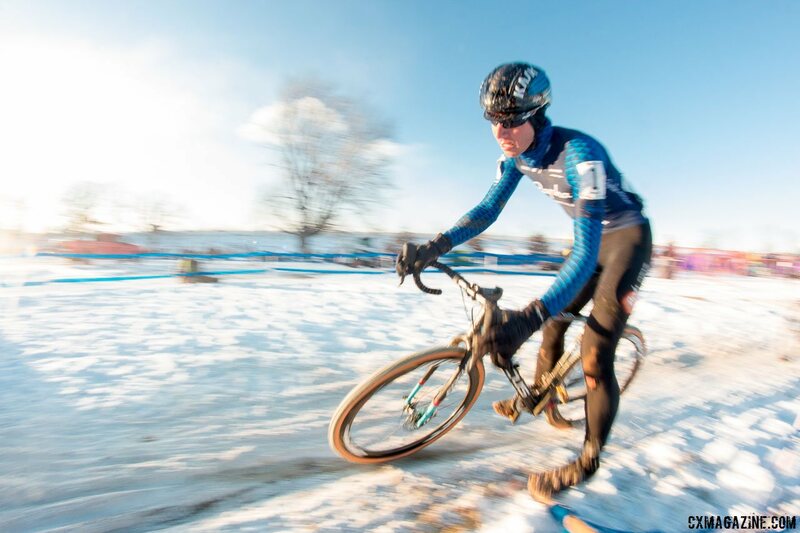 Coming into the Hartford Nationals, Werner had won three Collegiate Cyclocross National Championships, but his best Elite finish was 5th in Asheville in 2016. 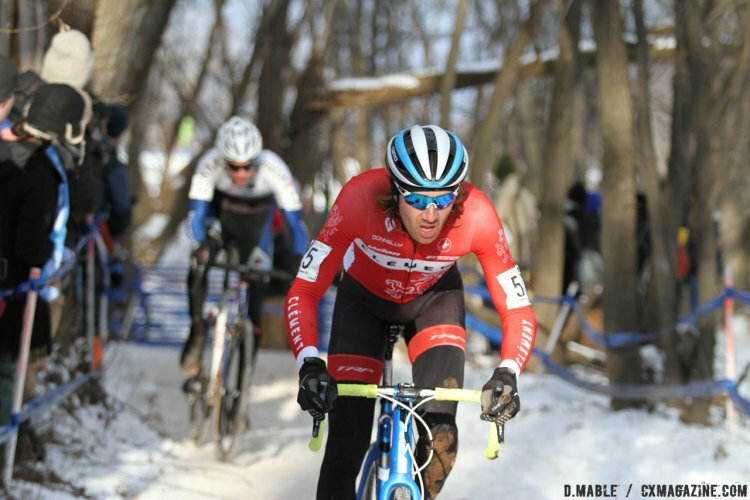 After having a successful ‘cross season this year, Werner told Cyclocross Magazine he had his sights set on the podium. Werner put himself in position to achieve his goal by getting off to a strong start and distinguishing himself from the large group that formed early in the race. He rode with Stephen Hyde for a while before settling into the bronze medal position behind Driscoll. 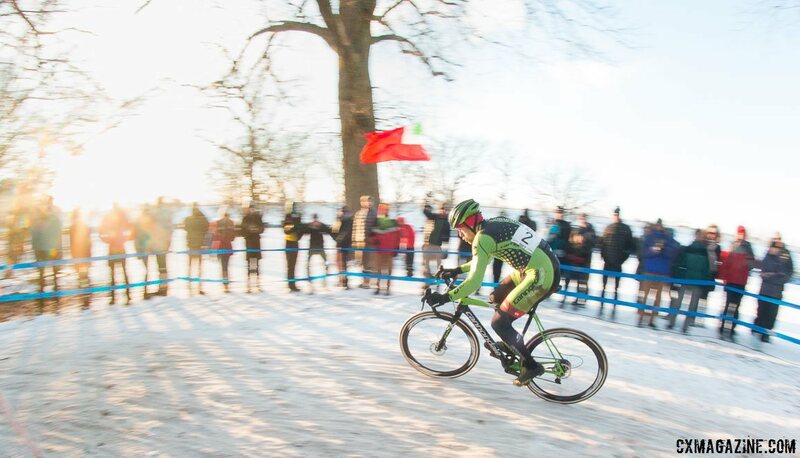 Stephen Hyde has made a name for himself by riding cyclocross courses aggressively. This season part of his success is due to his ability to minimize big crashes or other untimely mistakes. As it became apparent a healthy amount of snow would fall on Riverside Park before the race, one of the questions that emerged was whether Hyde would be too aggressive for the slick, rutted, technical course. 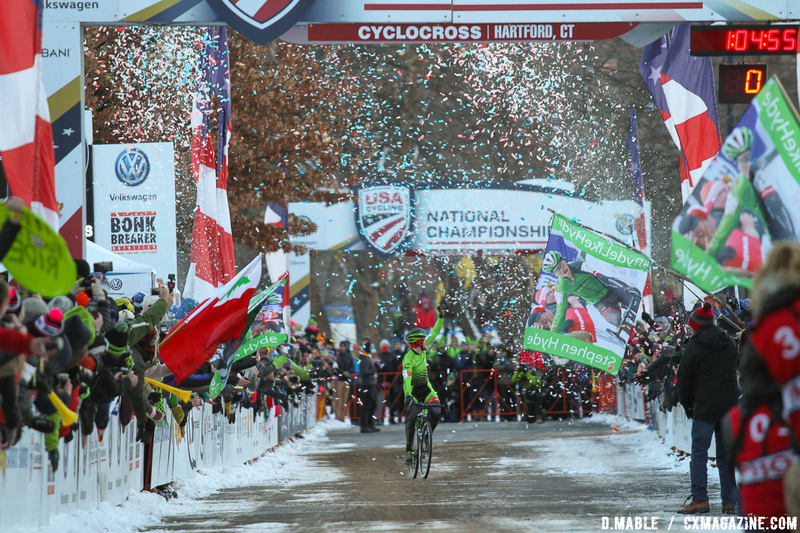 Stay tuned to Cyclocross Magazine for more coverage from the 2017 Cyclocross Nationals in Hartford. Thanks for using “melee” in the article. Damn…. so close! Great race! 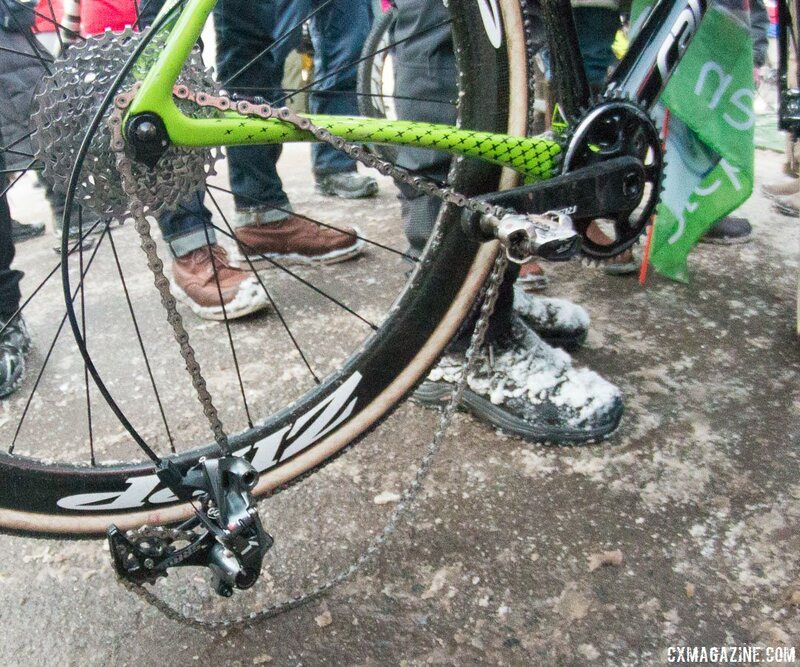 Cannondale still putting it’s “weak for even a road bike” hanger designs on CX bikes.